Also known as the Kaleici Marina, the old city's harbor features more than quietly docked boats waving gently and waiting to be sailed. There are many local restaurants that provide stunning views of the marina, where travelers can rest up and enjoy fresh seafood. Board one of the boats, manned by commercial crews ready for hire. Choose from private, luxury boats, or public boats that offer shorter, 2 hour trips ideal for visitors. Take advantage of the elevator shuttling visitors from the main street level down to the harbor, which features a viewing platform for a truly panoramic view. The gates of Hadrian is a stunning monument dating back to 130 CE, built to commemorate the visit of Emperor Hadrian. Besides being a beautiful relic, Hadrian's Gate marks the entrance to Kaleici, Antalya's charming, historic quarter. The beautifully constructed gates used to be a part of the city's outer walls and proves that history is more than just words in a book - that ancient citizens once lived here, whose monuments have survived the test of time. The gates are connected to two towers, built independently in different eras, during the rules of Seljuk sultans. Located just 7.5 miles northeast of the city of Antalya, this picturesque collection of waterfalls are more than just natural wonders. They are a haven for local wildlife and birds that nest by the water, and the Lower Düden Falls feed directly into the bright blue Mediterranean Sea. The group of waterfalls are part of a local recycle water station and feed into artificial cascades and irrigation trenches facilitating the distribution of water to the region. 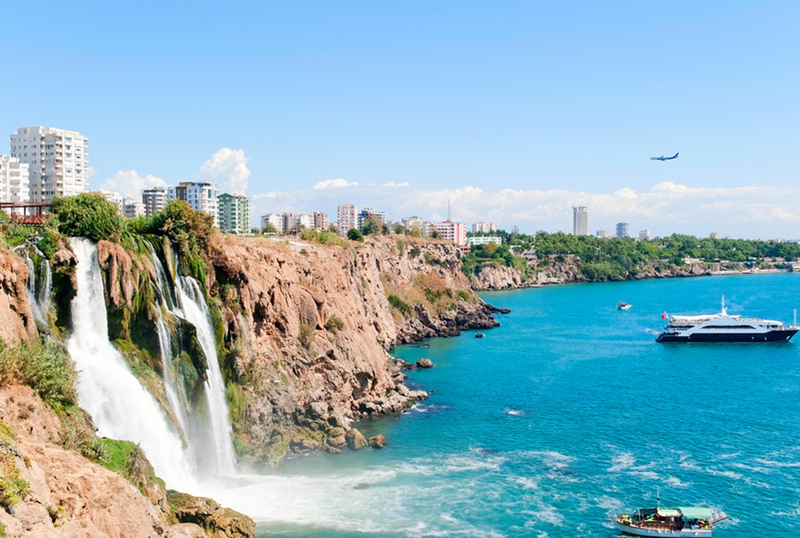 To view the waterfalls up close and personal, visitors can take a boat trip from the Antalya harbor and visit the surrounding park. With over 5,000 works of art covering an area of over 7,000 m², the grand Antalya Archaeological Museum is not only one of Turkey's largest museums but its richest as well. It features a combination of exhibition halls, gardens, and open air galleries, as well as live excavation sites along a long coastal strip of the Mediterranean. This means that beauty spreads as far as the eye can see and the smell of history is thick in the air. There are 13 permanent exhibitions on display featuring art, crafts, statues, ruins, artifacts, maps, and more. Viewed from the upper gallery, a traveler's sense of just how vast and well-preserved the Roman amphitheater of Aspendos truly is hits home. Today, the theater features the annual Aspendos International Opera and Ballet Festival, with international collaborations between opera and ballet companies from across the globe. However, during Roman rule and periods of conquer, the ancient city played a battle stage to Persian navies and Alexander the Great himself.